Apart from many Irish nationalists believing that Home Rule would follow if they fought for Britain; or the Ulsterman’s belief that after their sacrifice, Britain ‘would see them right,’ there were other reasons too, that drove young men into the British army at this perilous time in history. Men joined for heroic reasons. There were propaganda warnings that Irish women would be raped, land and farms confiscated, churches burnt and looted if Germany invaded Ireland as it had Belgium. Many joined because they were poor. Army pay was relatively good. There was accommodation, a certain status, and a pension whether you returned or failed to do so! And men joined for their own personal reasons. Francis Ledwidge, one of Ireland’s finest modern poets, professed that he joined the army, ‘because he didn’t want to let Britain stand between Ireland and an enemy common to civilisation.’ In fact he probably joined because his heart was broken by the rejection of his first love. Born August 19 1887 Francis was the eighth of nine children of Patrick and Anne Ledwidge. He was the first child born in the family’s new home, at Janeville just outside the village of Slane situated in the Boyne Valley, some 30 miles north of Dublin. Christened Francis Edward but known as Frank to his family and friends the fledgling poet would know hardship from an early age. His father died when he was just four years of age. Only three months after the birth of his younger brother Joseph, the burden fell on his mother Anne to provide for the family. She undertook back breaking work for the farmers in the fields for a meagre eight shillings a week. Despite this initial hardship Francis’ literary talents flourished from an early age. His school teacher described him as ‘an erratic genius’. After school he took a number of jobs including groom, farmhand, roadworker and miner. Dunsany introduced Ledwidge to the Irish literary circle of the time. He was the wunderkind among such giants as George Russell (AE ), James Stephens, WB Yeats, and the poet and patriot Thomas MacDonagh, with whom he became friends. At 25 years of age Francis grew in confidence, his poetry was more widely published. He became involved in local politics. But he was devastated when Ellie’s family, prosperous farmers, pressurised her to dump the young poet as he came from humble stock. Ellie reluctantly did so. She went on to marry John O’Neill, and to settle in Manchester. At the outbreak of war Francis followed Dunsany into the Royal Inniskilling Fusiliers, despite Dunsany’s pleading that he should not enlist. Dunsaney went as far as to give Francis money to keep him out of the army to continue writing. But Francis refused. Safely evacuated from the peninsula his regiment was sent to Manchester for rest. Ledwidge must have been aware that Ellie lived there. But he was dismayed to hear that she had died in childbirth. Furthermore the news of the Easter Rising, and the execution of his friend Thomas MacDonagh, brought him renewed sadness and stress. He was involved in an altercation with a senior officer, and charged with insubordination, being drunk, and over-staying his leave. He was court-martialled, and demoted. In July 1917, Ledwidge’s corporal stripes were returned. His unit was ordered to the Ypres salient, and committed to the Third Battle of Ypres. He was killed on the very first day of the battle, which I discussed last week. Next week: The death of Major Willie Redmond MP for East Clare prompted a by-election. It opened the way for a political colossus to emerge onto the Irish scene . NOTES: Francis Ledwidge, 30 years of age, is buried close to where he was killed in Artillery Wood cemetery, Boezinge, poignantly near the grave of Ellis Humphry Evans, a leading contemporary Welsh poet who, the same age as Ledwidge, was killed the same day. I have taken the quotes and photograph from John Quinn’s A Little Book of Ledwidge - A selection of poems and letters, published by Veritas, on sale €10. It includes an assessment by Seamus Heaney who describes Ledwidge as ‘a tender, beautiful figure, walking in a mist of melancholy’. Also from notes at the Francis Ledwidge Museum, at Slane; and an essay in the Dictionary of Irish Biography by Donal Lowry. 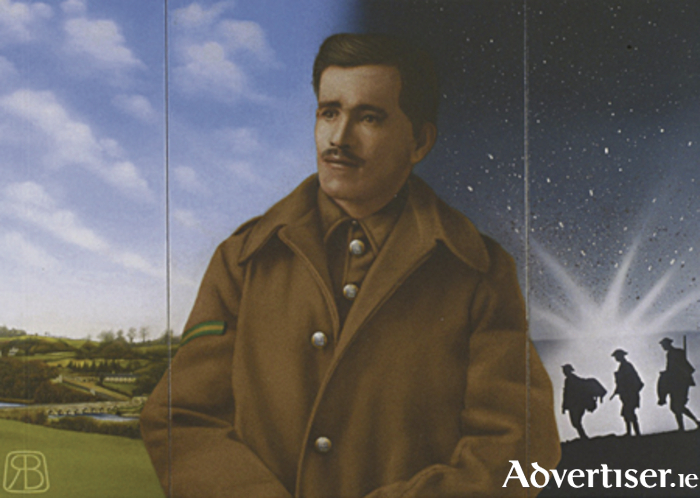 The illustration is Robert Ballagh’s portrait of Francis Ledwidge. I do not know how to write to you about the death of your dear son Francis. Quite apart from his wonderful gifts, he was such a lovable boy and I was so fond of him. We had many talks together and he used to read me his poems. He died on the feast of St Ignatius Loyola. The evening before he died he had been to confession. On the morning of the 31st he was present at Mass and received Holy Communion. That evening while out with a working party a shell exploded quite near them, killing seven and wounding 12. Francis was killed at once so that he suffered no pain. I like to think that God took him before the world had been able to spoil him with its praise and he has found a greater joy and beauty than ever he would have found on earth. May God comfort you and may His Holy Mother pray for you. I shall say Mass for Francis as soon as I can. Corporal John Walsh formerly of the Tram Yard Forster Street Galway was lost in action on the western front 100 years ago, on the July 31 1917. John and his friend Tom Barnacle from Bowling Green, were clerks in the office of the Galway and Salthill Tram company in Forster street. John’s father Philip Walsh, was the master of the Galway & Salthill Tram Company, they joined the Commonwealth forces in 1915 as an adventure to see the world. John was only 19. John’s family have visited Ypres in Belgium on many occasions to take part in the memorial services at the Menin Gate where John is honoured with the same zeal and attachment as 54,000 others, whose graves are unknown. John served in The Royal Artillery in the 2nd Battalion Leinster Regiment and was deployed in associated units when they needed man power. Unfortunately John’s service record was among those destroyed, during the London Blitz in 1940. John was acquainted with Frances Ledwidge, the poet. They both fought and died on the same day on the Ypres salient, and John often quoted verse in his letters from the then unpublished poem Soliloquy. He particularly quoted this verse in letters to his sisters Nora, May, and Bridie. The helpless child of circumstance.